Sharpening a knife with bench stones is an effective method for putting a keen edge on your knife. This short video will explain the proper techniques for freehand sharpening using bench stones. Anyone who has used a properly sharpened knife knows how effortlessly they cut compared to a dull knife. Because knives become dull over time, the only way to maintain a sharp edge is to sharpen your knife regularly. Sharpening a knife free-hand for the first time can be intimidating, but by following a few simple techniques you can turn dull knives into sharp knives in no time. 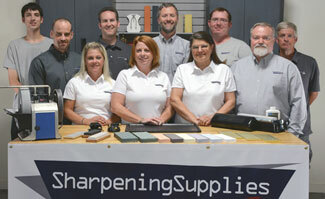 The sharpening process is the same for sharpening hunting knives, pocket knives or kitchen knives. Today I'll be sharpening this chef's knife. I'll be using the Norton IM200 Sharpening System for sharpening today, but any of these bench stones would work the same way. I'll be sharpening my knife to 20 degree bevel angle. I've already applied oil to the stone so we are ready to begin. The key to sharpening is to maintain the proper angle between the knife and the stone. The angle can be difficult to visualize. One of the easiest ways to arrive at the proper angle is to hold your knife at 45 degrees to the stone, then take half that angle to arrive at approximately 22.5 degrees. Minimal adjusting can be made to find your selected bevel angle. To make it even easier, the IM200 system includes a 23 degree wedge for accurate sharpening. With a slicing action, bring the length of the knife across the stone in a motion that starts with the heel of the knife and ends with the point of the knife. The motion should resemble a sweeping arc across your stone. Be careful to maintain the angle of the knife on the stone. Longer curved knives like this chef's knife provide additional challenges, but as long as you can maintain the angle you'll be sharpening effectively. Repeat this process on the other side of the knife. Be sure to make an equal number of strokes on each side of the knife to keep the edge symmetrical. After a few strokes on each edge with the coarse stone you'll be ready to move to the medium stone. Again, I'll make a few passes on this medium stone and then follow it up with a few passes on the fine stone. After you've worked through the coarse, medium, and fine stones your knife will be properly sharpened. The sharpening process is the same whether you are using oil stones, water stones or diamond stones. After practicing this technique a few times, you will be comfortable and proficient creating a sharp edge. Questions about sharpening by hand?